GW hosts Stuart-Hobson students for a high-school readiness camp. Students from Stuart-Hobson Middle School, a D.C. public school, graduated from the After-School All-Stars program on Friday at the Mount Vernon Campus. Stuart-Hobson Middle School students perked up with smiles on their faces as Planet Forward Director Dan Reed played a video that showcased an engineer’s innovative idea: using the energy of human movement to power electronic devices. “How cool would it be if you could walk down the street and charge your phone instead of plugging it into the wall?” he asked the incoming ninth graders sitting in a School of Media and Public Affairs building classroom on Wednesday. His bottom line? If you can dream it, you can do it. Mr. Reed was one of dozens of guest speakers who met with Stuart-Hobson students during “CampUs,” an intensive, overnight summer camp focused on preparing students for the transition from middle school to high school and then to college. The camp was held at the George Washington University from June 23 to 27 and organized by After-School All-Stars. All-Stars is a national nonprofit organization that partners with middle schools in 13 major cities around the country, providing 87,377 low-income, at-risk youths with an afterschool program that promotes academic, enrichment and physical fitness activities. All-Stars’ mission is keep children safe and healthy, help them graduate from high school, go to college and then give back to their communities. “CampUs” is the culminating event of the yearlong program—the final opportunity for students to prepare to succeed in a brand new school environment. This year, Stuart-Hobson Middle School, a D.C. public school, became the first school in the region to partner with All-Stars, and GW was chosen as the District’s inaugural “CampUs” host intuition. The camp focused on science, technology, engineering and mathematics (STEM). The majority of students who drop out of high school do so during their freshman and sophomore years, according to All-Stars National Program Manager Kanchan Sakhrani, who directed the “CampUs” program hosted at GW. That is why it is critical for at-risk students to obtain the skills, information and confidence needed to successfully transition into high school early in their academic career. “There are two burning questions that these kids have: ‘How is anything I learn in school going to be relevant to real life?’ and ‘Why do I need high school?’ Being here helps them envision what their future could be like, and they get very excited,” Ms. Sakhrani said. 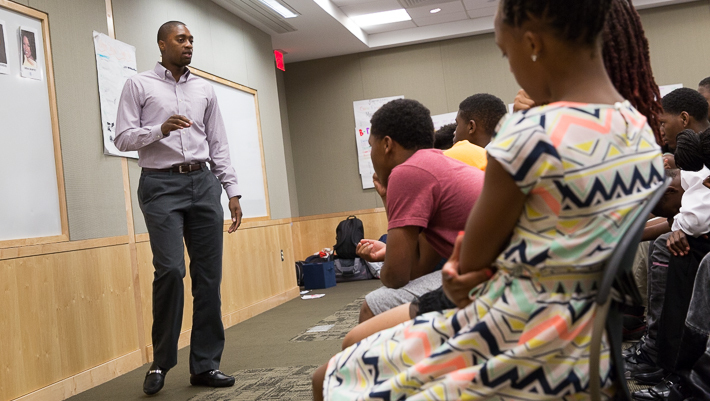 Maurice Joseph, assistant coach of the George Washington University men's basketball team, speaks to the Stuart-Hobson students during their graduation ceremony on Friday at the Mount Vernon Campus. During the week, the 40 middle school participants stayed in residence halls and attended high school prep classes on the Mount Vernon Campus, toured Foggy Bottom classrooms, participated in activities and received a taste of college life, with help from GW students, faculty and staff. The camp also included college prep classes, where the students worked on college admissions essays and studied for the SAT. On Wednesday, Vice Provost and Dean of Student Affairs Peter Konwerski met with the All-Stars to dispel some myths about college, talk about student organizations on campus and explain what GW looks for in applicants. GW undergraduates from fraternities and sororities also greeted the incoming high school freshmen and spoke candidly about their own university experiences. An ongoing business plan competition during the week tested the students’ creativity and teamwork skills. The students were split into groups, assigned a topic—such as music or multimedia—and were challenged to design a mobile application to be presented to a panel of judges at the end of the week. “The week is intense,” Ms. Sakhrani admitted, though there was time dedicated to playing games and having fun. Each day had a theme, from crazy socks to superheroes. The students also heard from STEM professionals, including those who work in the engineering, cyber security and entertainment industries. The All-Stars toured locations around the District, like the Department of Defense, the Politico newsroom and the TV studio in the School of Media and Public Affairs. These field trips and guest speakers not only opened the students’ eyes to new career paths, but they also helped connect them to D.C., Ms. Sakhrani said. “Our kids are coming from all over the District. I don’t think this is a part of town that they get to very often. Our goal is also to get our kids out of bounds and show them their community,” she said. For 14-year-old Tifari Walker, a presentation from a psychiatrist during “CampUs” week further sparked her interest in psychology. She plans to study the subject in college along with journalism. But first Ms. Walker needs to make it through high school. She said her favorite part of the week was taking the intensive classes, where she learned skills like time management. Hosting the After-School All-Stars "CampUs" week is just one way the university is continuing to open up college opportunities for lower-income students within the D.C. community. In January, George Washington President Steven Knapp formed a university-wide Task Force on Access and Success. The task force was charged with focusing the university's current efforts, looking for new ways of encouraging college attendance, and ensuring that the university does everything possible to guarantee the academic success of lower-income GW students.